Fruits and vegetables contain vitamins, minerals, and other nutrients that are essential for good health. That's one reason why a plant-based diet that includes lots of fruits and vegetables can lower your risk of developing life-threatening diseases such as heart disease, diabetes, and some cancers. And when you pile on the produce, there's less room for the unhealthy foods, too. Dinner is typically the largest (and latest) meal of the day, and it's a good opportunity to make sure that you meet your daily quota for fruits and vegetables. Here are five easy ways to work more produce into dinner. Roast vegetables. Roasting is a great way to let the deep, rich flavors of vegetables shine through. 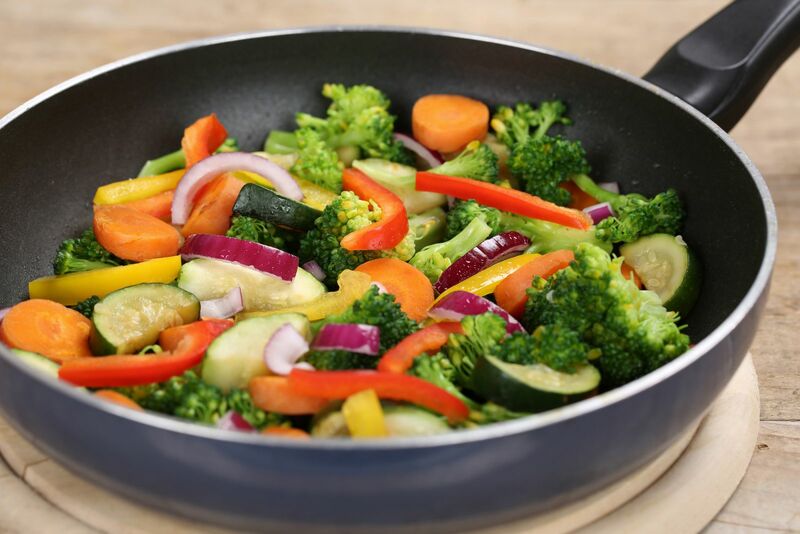 Bake cut vegetables at 375° F for 20 to 25 minutes or until they're lightly browned. You can roast any vegetable — from mushrooms, onions, eggplant, and zucchini to tomatoes, broccoli, and carrots — so don't limit yourself. Enjoy roasted veggies as a side dish, or toss them into pasta dishes and other recipes. Poach veggies in low-sodium chicken broth and white wine. To poach, boil enough liquid to cover the vegetables. When it boils, add the vegetables. Turn down the heat to just below boiling and cook the vegetables for about five to seven minutes, until they're brightly colored and tender-crisp. Add garlic, basil, or tarragon for a flavor bonus. To retain nutrients, keep a watchful eye on the pot or set a timer so you don't overcook. Smuggle fresh-cut vegetables into main dishes. Try adding mushrooms, peppers, zucchini, onions, or carrots into pasta sauces, casseroles, soups, stews, scrambled eggs, and chili. Have a salad with dinner most days. Starting with a salad can help you consume fewer calories at the meal, as long as the salad is no more than 100 calories. A healthful salad consists of about 3 cups of dark-green leafy lettuce, 1⁄2 cup carrots, a tomato, 1⁄4 cucumber, and 1 1⁄2 tablespoons of low-calorie dressing. Try tossing in some petite peas, onions, celery, or peppers for an extra boost of nutrients. Choose fruit — fresh or frozen, stewed or baked — for dessert. It all counts toward your daily produce quota. Dried fruits are healthy but high in calories, so eat them sparingly. For more on developing a week-by-week action plan to improve your diet, and on setting goals for success, buy The 6-Week Plan for Healthy Eating, a Special Health Report from Harvard Medical School.